It’s not easy but it’s not that difficult either. 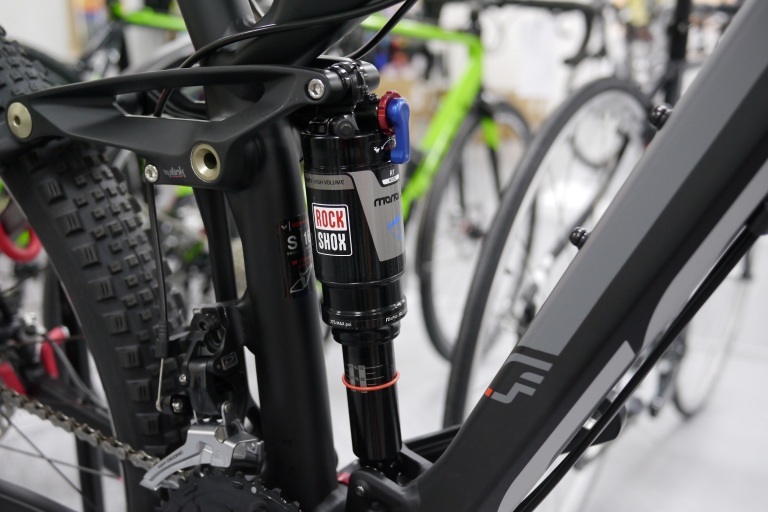 Here are the essential pieces of advice you need to best set up your mountain bike suspension. Suspension is essentially two things: a spring and some damping. The spring part of things is easy to set up. And there are right and wrong ways to do it. The damping part is more complex. There is no absolute ‘best’ way to set it up but there are ways of definitely getting it wrong. The spring these days is very rarely an actual metal coil spring. Modern mountain bike forks use air pressure as the spring format. Imagine a space hopper. Blow loads of air into it and it becomes harder – a harder spring. Let air out of it and it becomes softer – a softer spring. It’s the same effect with adjusting the air pressure via the schrader valve on a suspension fork or rear shock. A space hopper has no damping. Damping is what controls how a spring compresses and re-extends. Damping is usually a fluid passing through a hole. Imagine water going down a plughole. The bigger the plughole the faster the water drains out of the bath. So basically, when setting up suspension, you’re adjusting the air pressure in your space hopper and adjusting the size of your plughole. Okay? Good. First of all, turn all the damping dials to their minimum setting. When setting sag it’s best to have as little damping as possible interfering with how the spring behaves. You need to adjust the air pressure in your suspension fork or rear shock until the sag point is correct. You will need a shock pump to do this. What is sag? Sag is the amount of travel that is used up just by you being (feet off the ground) on the bike. The correct window for suitable amount of sag is 25%-30%. In other words 25-30% of the total amount of suspension travel should be used up just by you being on the bike. 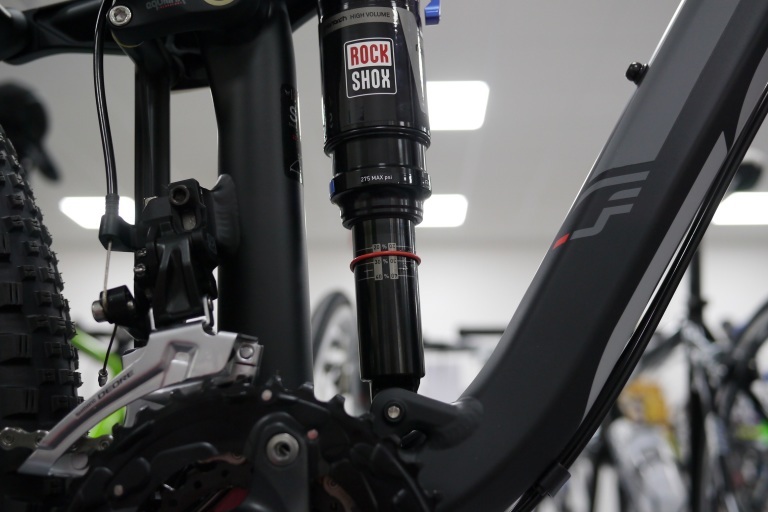 Setting up the correct sag for your rear shock is relatively simple. Almost all of your weight is in the middle of the bike and so the rear shock compresses without much restriction. Whilst off the bike, move the rubber O-ring (your shock should have one on as standard) on the rear shock shaft until it butts up against seal of the main shock body chamber. Sit on your bike. Briefly but calmly lift both of your feet off the ground. The rear shock will compress. Put your feet down and get off your bike. Measure how far the rubber O-ring has moved down the shock shaft. A good amount to aim for is 25% of travel used. Most bikes perform at their best with around 25% sag. Setting up the correct sag for your fork isn’t quite as straightforward. The problem is that forks don’t like to sag. Even with all the damping dials set to minimum there’s still a resistance to compress for various reasons. You can adjust the air pressure to the ‘rider weight’ guidelines written in your forks instruction manual (it’s often written on the back of one of the fork legs too). Or a method which I use is to ride around somewhere flat, safe and spacious and see how much you can compress the fork by pushing/plunging down as hard as you can on the handlebars. Once you’re achieving around 75% of travel used up by your forceful plunging, you’re done. Your sag will be correct. Is your sag correct? Do not try to set up damping until your sag is correct! 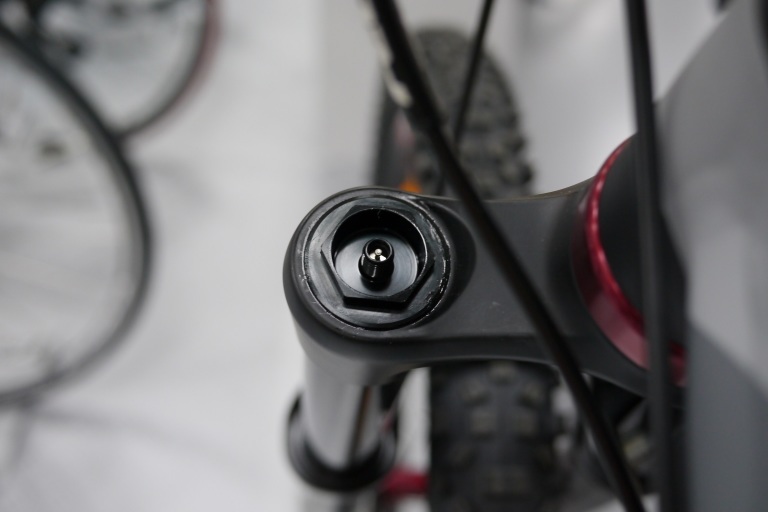 A lot of suspension forks and rear shocks only have one sort of damping adjustment: rebound. So we’ll deal with this. If in doubt, it’s better to err on the side of having too much rebound rather than having not enough. 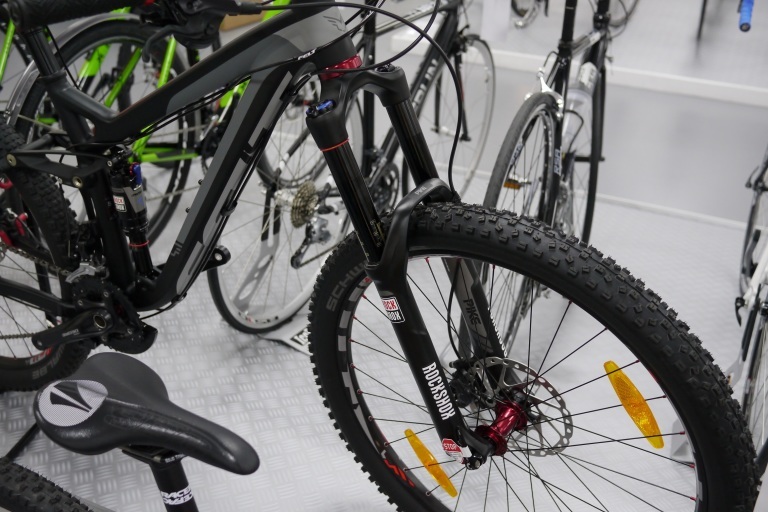 Not enough rebound will cause your bike to bob around more under pedalling and can cause you be buckaroo-ed off your bike on rough trails or jumps. Too much rebound will prevent your suspension from being able to re-extend during an onslaught of bumps. Your fork will ‘pack down’ and become harsher. I still like the ‘ride off a kerb’ method of setting up rear shock rebound damping. Start with your rear shock. Turn all the rebound damping to its minimum setting. And minimise any compression/platform/propedal damping on there too. You’ll need to look at your rear shock as you’re riding off a kerb so please take care. Do it somewhere traffic-free and keep your wits about you. Ride sat-down slowly off a kerb. As the rear tyre rides off the kerb and lands on the road your shock will compress (beyond its sag point). It will then re-extend. It will then compress again (and maybe even again). In other words, it will be bouncing around like a trampoline. Increase your rebound damping by two clicks and repeat the process of riding sat-down slowly off the kerb. The goal is to achieve a level of rebound damping where the rear shock re-extends after compressing but doesn’t do any of that trampoline-ing stuff. As with setting fork sag, setting fork damping is trickier than setting rear shock damping. The kerb technique still kind of works. You need to do it whilst stood up on the bike as opposed to being sat down but the general idea is the same. Ride stood up slowly off a kerb. As the front tyre rides off the kerb and lands on the road your fork will compress. It will then re-extend. It will then compress again. In other words, it will be bouncing around like a trampoline. Increase your rebound damping by two clicks and repeat the process of riding stood up slowly off the kerb. The goal is to achieve a level of rebound damping where the fork re-extends after compressing but doesn’t do any trampoline-ing. The proof will be in the pudding however. Go for a ride. If you feel the fork is being a bit overly bouncy on climbs increase your rebound by two clicks. Some fork bounce is okay and is sometimes unavoidable in fact. During a ride, if you find the fork packing down on descents resulting in an undesirably steep head angle, don’t assume you have too much rebound. You may have but there are other things that may be causing the packing down and you should check those first. What other things? Your fork spring may be too soft. Try upping the air pressure a bit. If your fork has compression damping adjustment, increase the low-speed compression damping by two clicks. Continue your ride, adjusting as you go until you’re happy. 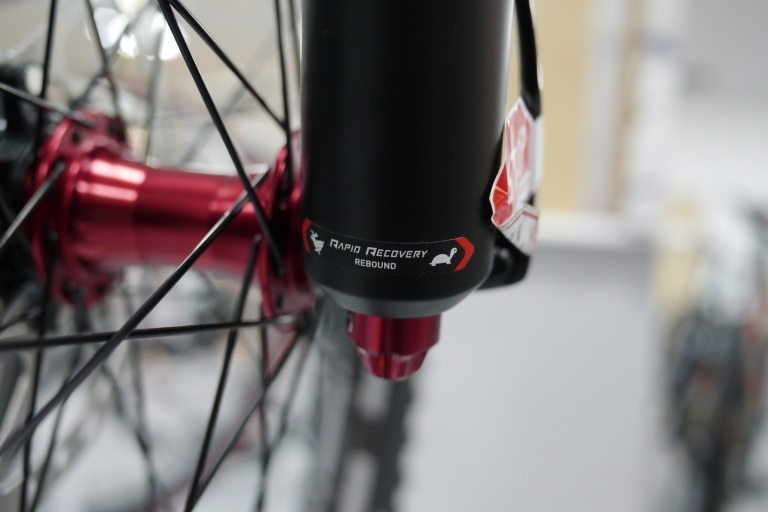 If your fork is still packing down after upping the air pressure and increasing the compression damping, then you can try adjusting the rebound damping. 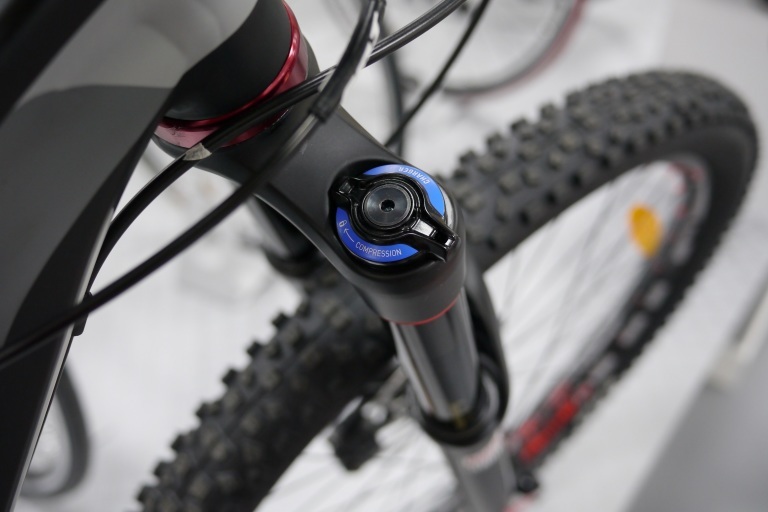 Reduce rebound damping by two clicks and continue your ride. Now we’re edging into the realms of complexity. If you don’t want to learn about compression damping, that’s fine. Most bikes come with pre-set un-adjustable compression damping anyway so chances are you can’t adjust it. Sag and rebound are the vital things to know. Go and ride your bike. If you are looking to learn a bit more about fine-tuning suspension set up then read on. I’ll try to keep it clear and not boring! Compression damping affects how suspension compresses. It’s possible to adjust how the suspension compresses at different velocities and/or under different types of forces. Why damp your compression at all? Why would you want to slow down how your suspension compresses? Won’t that stop it from absorbing bumps effectively? Suspension should generally be set on the firm side. Most people have their suspension set up with insufficient amount of damping. They want to feel their suspension squidging. Most riders’ bikes are like riding around on a bouncy mattress. This is not how suspension should feel. It’s not what suspension is for. Suspension is not about comfort. It’s about control. Think ‘rally car’ not ‘marshmallow’. You’ll still get the suspension giving out the travel. A lot of riders have a major fear of “not using enough travel”. Travel is principally dictated by how hard the spring is, not how much damping you have dialled in. Most riders are using too much of their travel too often. There will be rides where you don’t use more than 75% of your travel. That’s fine. Good in fact. You don’t have to bottom out your fork and shock every ride. That’s a myth. Compression damping is often more about dealing with forces that come from the rider above, not the terrain below. Low speed compression can be used to prevent or reduce pedalling induced bobbing. If your bike bobs around too much when you’re pedalling dial in a couple more clicks of low speed compression damping. Increasing your fork’s compression damping (especially low speed compression damping) can prevent ‘fork dive’. Fork dive occurs during braking or heavy cornering where the fork is compressing due to forces coming from above (rider weight load). If you find your fork sinking excessively under braking then dial in a couple more clicks of low speed compression damping and continue your ride, adjusting again if you need to. Tagged compression, damping, fork dive, how to, marzocchi, miantenance, pike, rebound, rockshox, skill, technique, workshop. Bookmark the permalink. Is there any merit to women-specific forks? Great article and some good tips. You did however refer to rebound damping as rebound a few times which while I knew what you meant, would be confusing to a beginner and actually send them in the opposite direction. Hey guys great article, good to see the black art of suspension fettling put in some simple to understand terms. I am to tinker with mine now!